It’s no secret that I am a salad fanatic and my great love of crunchy vegetables extends to slaws. Today’s Spicy Mango Slaw is currently near the top of my list of favourite side dishes. It pairs gorgeously with grilled chicken of any sort; particularly with jerk chicken since they both make ample use of Caribbean flavours. It is also lovely alongside grilled, broiled, or baked fish, all sorts of pork dishes, and even grilled, thinly sliced flank steak. All of that versatility makes Spicy Mango Slaw the perfect candidate to be the first official entry in my new SPEEDY SIDE DISHES category dedicated to side dishes that pack a maximum punch of flavour with a minimum investment of time and effort. 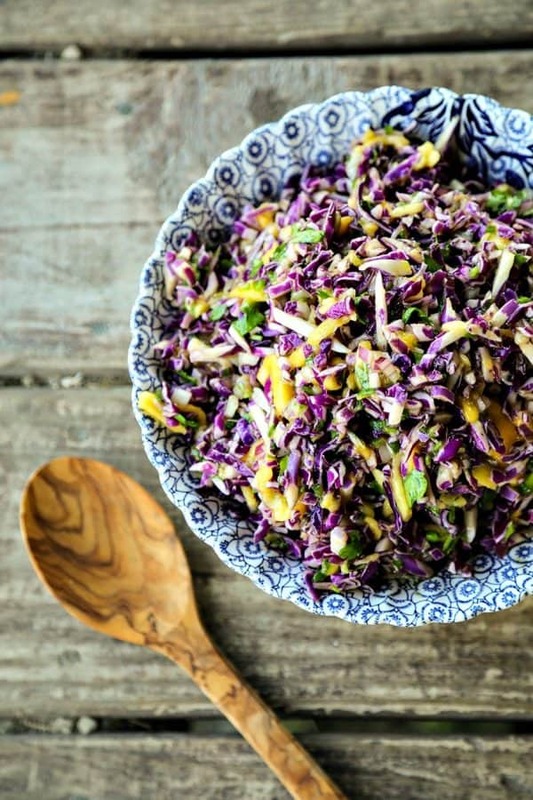 Spicy Mango Slaw owes its crunch and some of its beauty to purple cabbage. The spice comes courtesy of fresh, lovely green jalapeno peppers. There is a hint of tropical sweetness from just barely ripe mango, and the tart and tangy lime juice and honey dressing gets a flavour boost from minced red onion and fragrant cilantro. 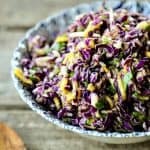 You can choose to shred your own purple cabbage or use pre-grated purple cabbage as the base for your Spicy Mango Slaw. Either way, you’ll have that gorgeous purple colour and the crunch. If your red onion is unpleasantly strong, you can let it soak in a little cold water for a few minutes, strain it, rinse it, sample, and if needed repeat the process until the onions are milder. There’s a range of quantities given for the fresh jalapeno peppers in this recipe for a couple of very good reasons. Jalapenos vary WILDLY in their spice level. You’ll definitely want to sample a tiny little sliver of the pepper to see how fiery yours are. If they’re screaming hot, just add half of one. If they’re mid-range, add a whole minced pepper. If they’re mild, add up to minced peppers, keeping your personal heat tolerance in mind. Now let’s talk mangoes. You definitely want to get a mango that is still firm or it will go all soggy and soft in your Spicy Mango Slaw which will be a bit of a let down. It’s better to err slightly on the side of under-ripe, but if you can find one that is just barely ripe and still firm you’ll be happiest. 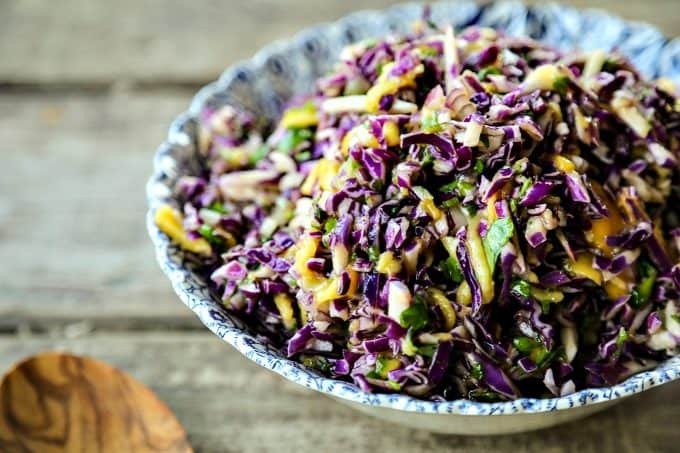 Spicy Mango Slaw is crunchy purple cabbage with a hint of tropical sweetness from just barely ripe mango, and the tart and tangy lime juice and honey dressing gets a flavour boost from minced red onion and fragrant cilantro. Gently toss all of the ingredients together in a mixing bowl. Cover tightly and refrigerate for at least 1 hour for flavours to meld. This slaw is best eaten within 48 hours of being made, but is still good for 4 days. Like the Spicy Mango Slaw? You might love these, too! It’s absolutely gorgeous! Feast for the eyes and, no doubt, the tastebuds. Can’t wait to make this! Can you use dried mango, or another fruit in the winter months? Perhaps a canned mango would work! I’ve not tried it with dried mango.